Members of The Quilters' Guild of NSW Inc will be aware that the August General Meeting provides an opportunity for reward from Studio clean-outs! Its not too early to book a table for inclusion, and numbers will be limited. Allocation will be at the discretion of Management Committee, after initial contact with The Meetings Co-ordinator. 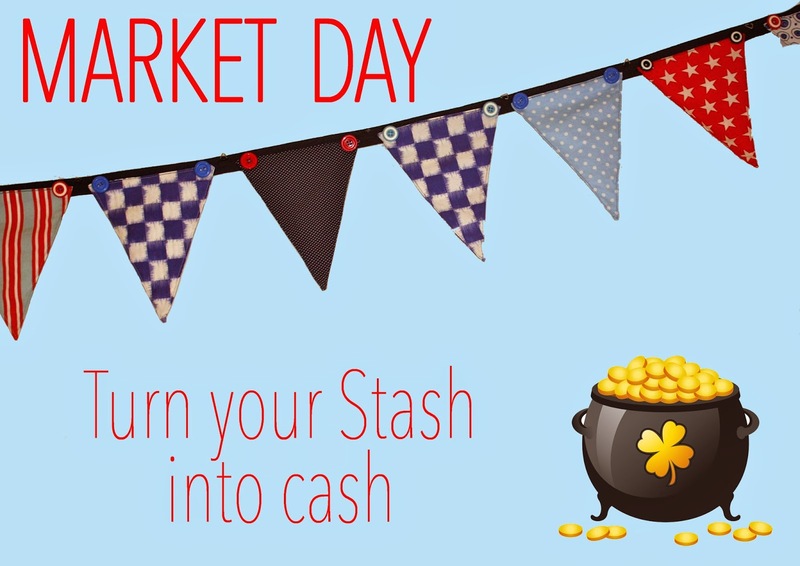 Please email the Meetings Co-ordinator to be considered for inclusion this year at the 'Market Day' Meeting on Saturday 15th August 2015. Please note : no bookings will be taken by volunteers in the Guild Office. 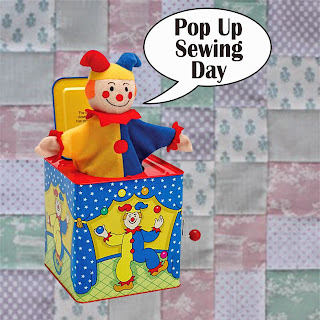 Stall Holders must be Guild Members, and tables will be available for $5. As expected, there were no spare chairs to be had when 36 members of The Quilters' Guild of NSW Inc gathered to view the quilts that recent Friday Showcase Presenter, Wendy Williams, shared. Her creations were wonderfully whimsical and colourful, and made with a meticulous attention to detail. 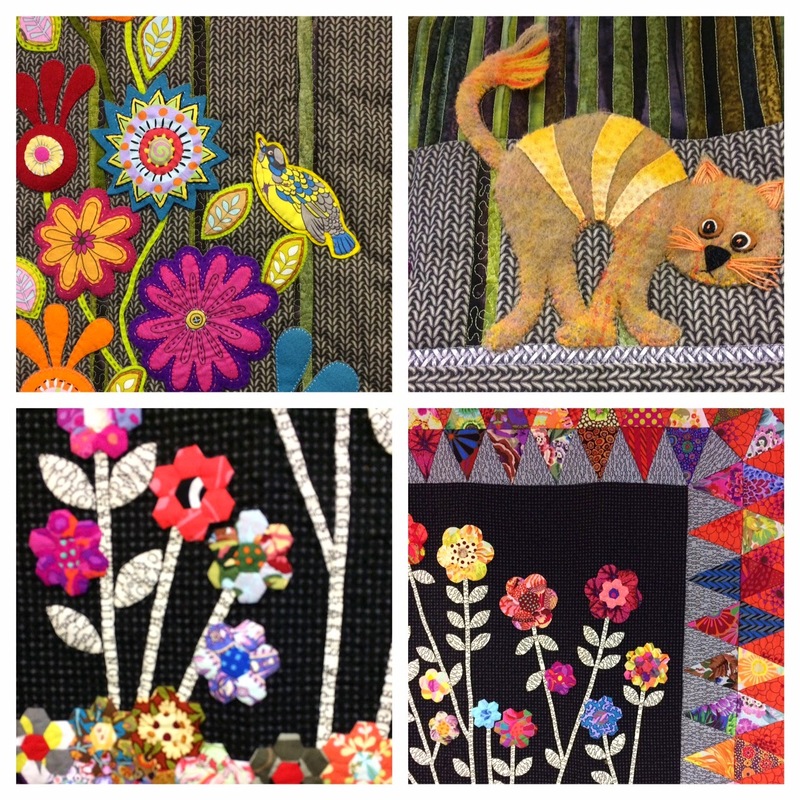 Please visit the Guild Office to see some of Wendy's work displayed on the walls and thus appreciate her fine applique and fabulous embroidery embellishment. A more detailed account of Wendy's presentation will be published in a future edition of The Template. There will not be another Friday Showcase until July, so there is plenty of time to visit the office. 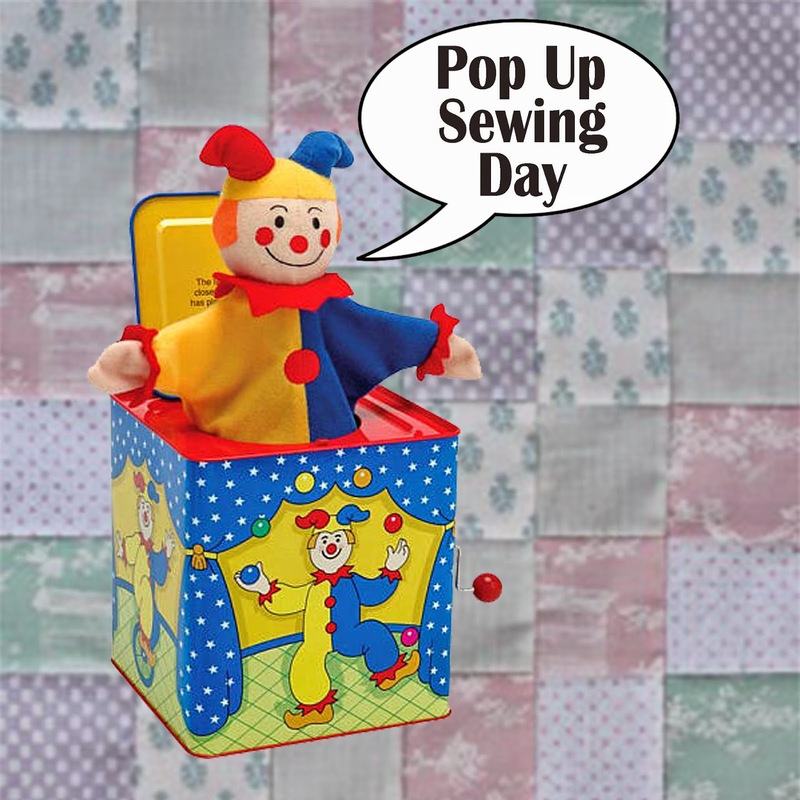 The Quilters' Guild of NSW Inc. is delighted to once again be part of this wonderful opportunity for children, young adults and those under 35 to showcase their textile talents. 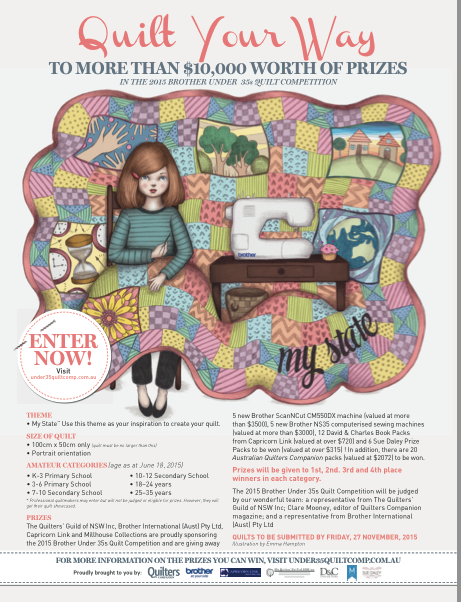 Prizes are going to be very desirable, and the many supporters and sponsors of this competition are to be congratulated for promoting Quilt involvement amongst youth. 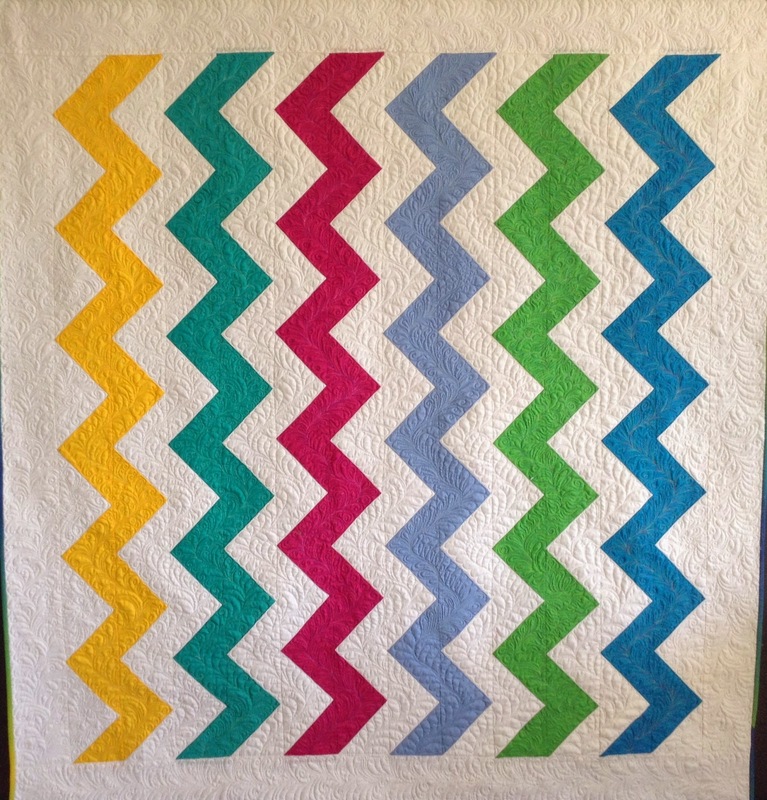 Please visit Quilt Your Way for an online entry form. Remember the 2012 Guild Challenge : Pearl? The more than 50 quilts entered in that Challenge have completed their touring schedule and are now available for collection. Your entry can be obtained from the Guild Office (between 10am and 3pm weekdays). They will also be available at the Guild General Meeting at Burwood on 16 May. The Management Committee of The Quilters’ Guild of NSW were delighted with the Online Entry response from members for the upcoming Sydney Quilt Show. Membership application and renewals for the coming financial year can now be facilitated online. Collect a printed form from The Sydney Quilt Show. Contact the Guild Office and have a printed form mailed. A big “Thanks” to those who organized this new method of membership renewal, and to those who were willing to navigate the SQS Entry Form, thus convincing Management Committee that our Guild can keep up with the times! The Block of the Quarter. As can be seen : two fabulous and different settings for this Block of the Quarter : Hour Glass Block. 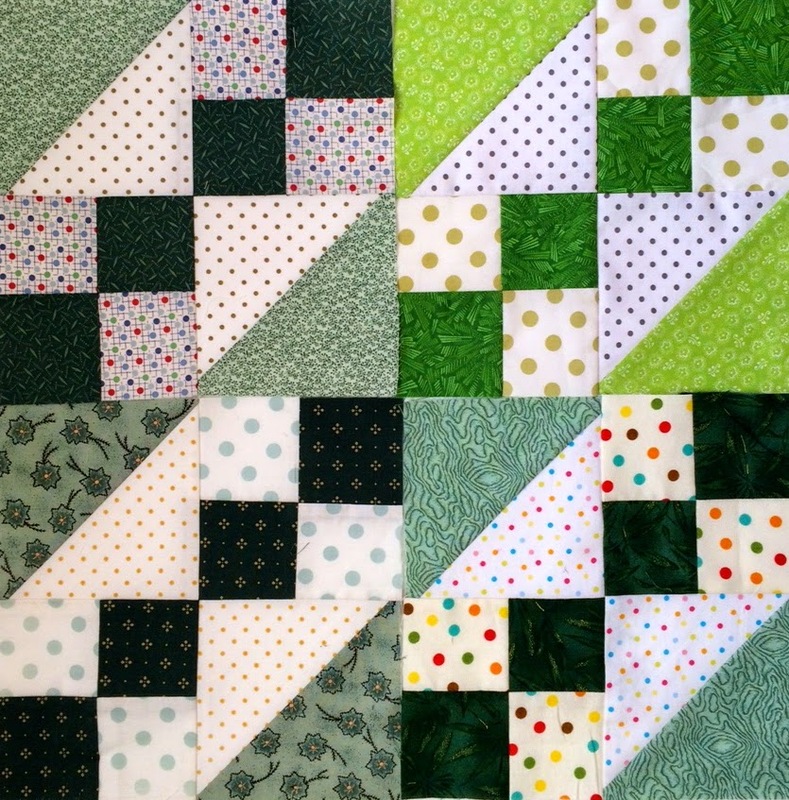 Please bring your blocks to the General Meeting of The Quilters' Guild of NSW Inc., this Saturday. Attach your name and address to every block, and remember, winner takes all! The next Burwood General Meeting promises a day of much shared information, colour, and fun. The Demonstration will be conducted by Deb Louie, a recent Guild Scholarship Holder. · I will be demonstrating the pure enjoyment of quilting free form feathers to suit any space in your quilts. Embracing the free motion quilter's own individual feather style, to have unique 'one of a kind' beautiful feathers. No marking necessary and I will explain many different styles of feathers, from formal feathers, hook, top and tail, curl and back tracking feathers. S So, if "feathers" have failed you in the past, then come early to get a ringside seat next to Deb as she FMQ's her magic! Attendees who wish to "Shop" will be enticed by the beautiful fabrics and notions available from the owner of Appleyard Cottage - Veronica Appleyard. She has suggested that Members might like to visit her website prior to the meeting. Should there be any product in particular that members may wish her to bring to the meeting, then please don't hesitate to contact her, and she will endeavour to have them at the Burwood meeting. Her Powerpoint Presentation and display of textile works is entitled " Living in Two Worlds - a Fabric Collage". Di's inspiration to create comes from the beautiful fabrics, papers and intriguing items that pepper her eclectic collection. Her resources are unique and treasured, and she uses them to weave a visual story to delight her viewers. Following on from Di will be a Special presentation by Trish Bloomfield. 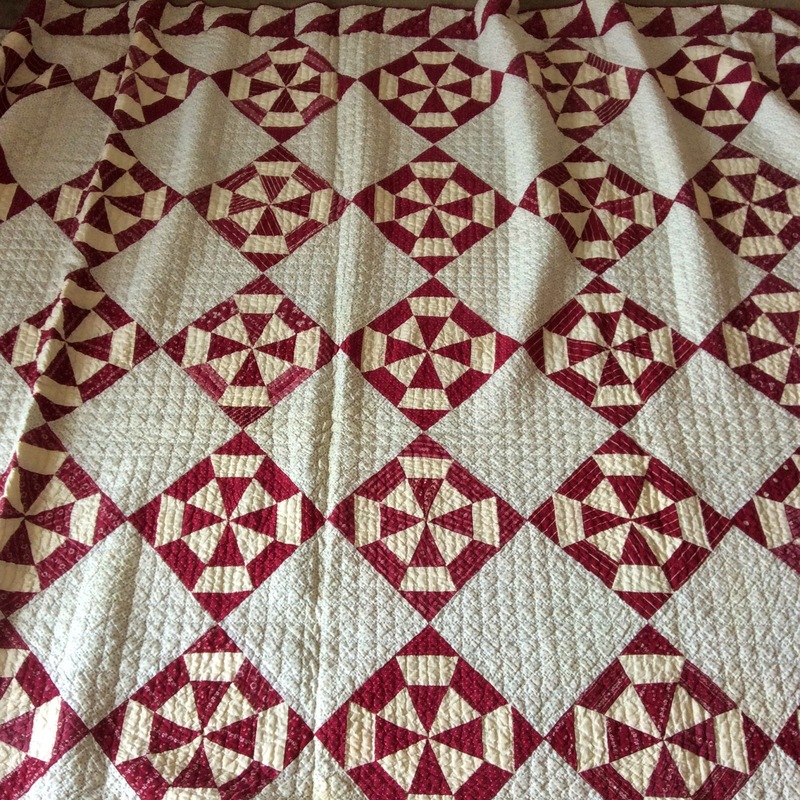 Instead of our usual "Show and Tell" Trish will be sharing the stories behind 7 of her valued antique Red and White Quilts which will be on display. Afternoon Tea, BOQ and Lucky Door draw will occur after Trish has spoken to the Guild. Please remember to bring your own coffee mug and BOQ's. Judy Newman, Craft Consultant at Expertise Events, has informed The Quilters' Guild of NSW Inc., of the recent winners of the 2015 Challenge 'True Blue' , at the Australasian Quilt Convention, held in Melbourne in April. Congratulations to the following Participants. 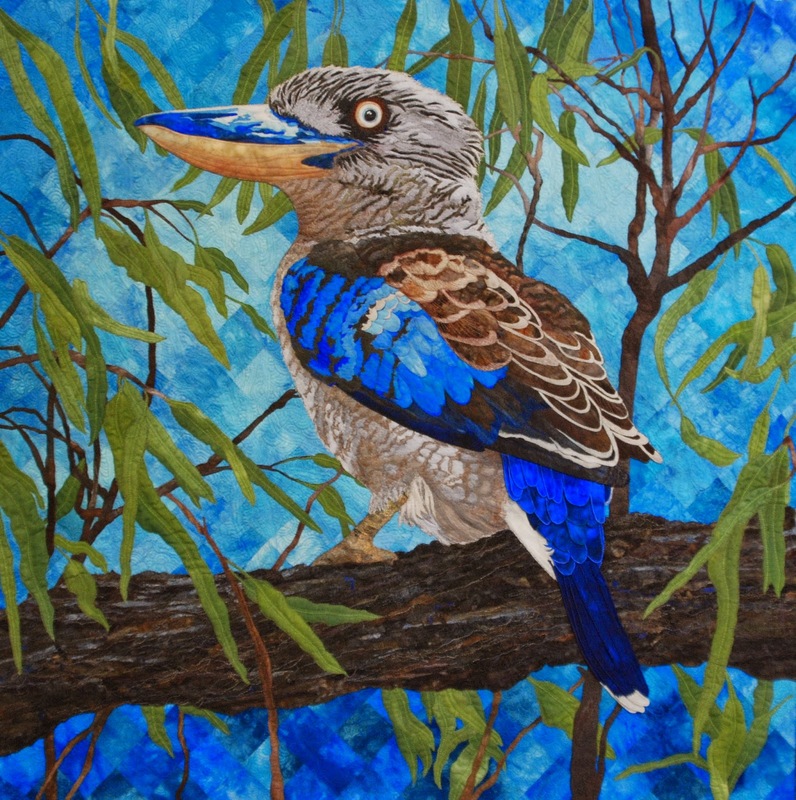 First Prize accolade went to Queenslander Jeannie Henry’s depiction of a commanding blue-winged kookaburra perched on the branch of a iconic Australian gum tree against a beyond blue sky. Exquisitely executed pieced and dyed background, layers of appliqué, manipulated fabric, machine embroidery and machine quilting, bring the powerful design to life. True Blue Jacko delivered a cash prize of $3500 from sponsor Expertise Events. 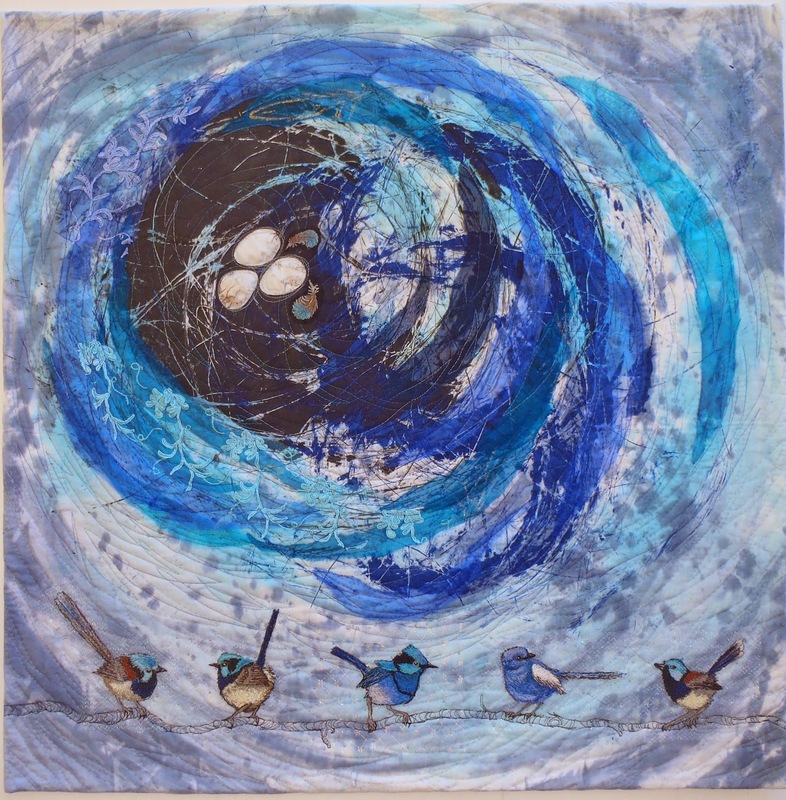 Runner up went to Really True Blue by Jan Clark (NSW) featuring the much loved blue wren against an abstract nest. Jan used dyeing, screen printing, thread drawing and machine quilting to create her piece and collected $1500 in prize-money. Announcing the theme for the 2016 AQC Challenge: Expertise Events is pleased to advise that the theme will be Tradition with a Twist. The dates for next year’s AQC are: April 14 – 17, 2016; Royal Exhibition Building, Carlton Gardens, Melbourne. The Crescent Head Quilt Show, advertised on Template Free a few days ago is still being held this weekend, despite the progression of rain and wintery conditions along the State's North coast. Please come and support this hard working group and their quilt show. They promise to offer a dry, warm and welcoming venue, with hot food and drinks. The children of the community will love for you to see their quilts, and All proceeds of the weekend will be donated to Crescent Head Primary School , Crescent Head Preschool and Macleay Hospice. Red and White fabric squares needed. No doubt all members of The Quilters' Guild of NSW Inc. who have an entry in the Red and White Category of the 2015 Sydney Quilt Show will now have a sewing studio awash with red and white fabric scraps. 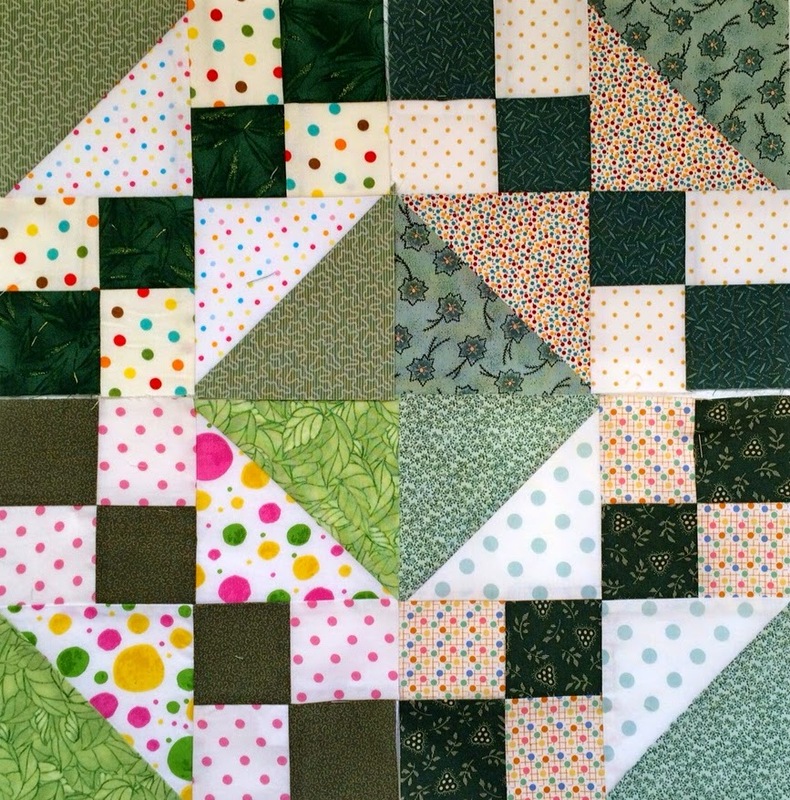 Guild member Margy Syrett, in charge of Kids Skills at the SQS, is asking for donations of 3" squares of your R&W scraps for use at this year's quilt show. This will help carry on the celebration of our special category and help rid you of your "left-overs"! So, please start cutting, to donate. Kids Skills is always such a popular activity, and difficult to administer without the generosity of fellow guild members. Squares can be sent to the Guild Office, or brought to the next General Meeting at Burwood, on Saturday 16th May.